Each StingRay Parts Washer is a pre-designed Configured Industrial Parts Washing Solution. Our unique aqueous washer design allows us to easily configure an industrial cleaning machine specifically for your needs from our pre-designed options. 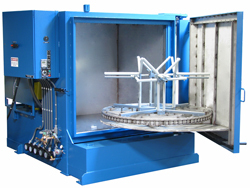 Your parts washer configuration is equivalent to getting a custom parts washer. StingRay offers 116 options and features on every industrial parts washer that tailors your washing machine specifically for your cleaning application. Talk to our Parts Washer Application Specialist about your aqueous part washing needs.